One of the most enjoyable parts of looking at family pictures is finding resemblances. You have your father’s brown eyes and your grandmother’s curly hair. You’ve got your aunt’s basketball height and your cousin’s freckles. But some similarities might not be so appealing—could one of those be a family tendency toward gum disease? Studies have shown that periodontal disease appears to have some kind of genetic component, especially for serious diseases and those that appear early in the patient’s life. Aggressive periodontitis, for example, a relatively uncommon disease which causes rapid bone loss around certain teeth, is often more common among members of the same family. Other studies suggest there might be a genetic link between our immune response and the development of chronic periodontitis. So far, however, the link between genetics and gum disease is still under investigation. We do know that environmental factors are an important trigger for gum disease. Failure to brush and floss, smoking, diet, stress, medical conditions such as diabetes—all can influence the health of our gums. The best way to overcome these factors is your own proactive approach! Thorough brushing and flossing, regular checkups and cleanings, proper nutrition, and avoiding smoking are all time-tested ways to keep your gums and teeth healthy. If you have a medical condition, proper treatment and medication will also help protect your oral health. During your examination with Dr. Cody Henriksen at our Sioux Falls, SD office, please tell us about any family history of periodontal disease, your own gum care routine, and any habits or conditions which might influence your health. We can tailor treatment and offer suggestions for prevention based on a thorough knowledge of your medical history. 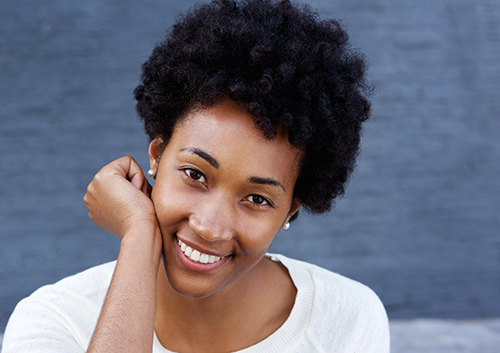 We have many options available today for preventing and treating gum disease. Let’s make sure all your family albums are filled with beaming smiles—that’s the most appealing resemblance of all! More serious periodontal diseases, while relatively uncommon, can affect children and teens as well as adults. Aggressive periodontitis, for example, results in connective and bone tissue loss around the affected teeth, leading to loose teeth and even tooth loss. Let Dr. Cody Henriksen know if you have a family history of gum disease, as that might be a factor in your child’s dental health, and tell us if you have noticed any symptoms of gum disease. The best treatment for childhood gum disease is prevention. Careful brushing and flossing and regular visits to our Sioux Falls, SD office for a professional cleaning will stop gingivitis from developing and from becoming a more serious form of gum disease. We will take care to look for any signs of gum problems, and have suggestions for you if your child is at greater risk for periodontitis. Together, we can encourage gentle and proactive gum care, and check off one more goal accomplished on your child’s path to lifelong dental health! Your infant’s first teeth will begin to appear around six to 12 months of age. You might wonder how important these primary teeth really are. After all, baby teeth are destined to fall out within a few years and be replaced by a full set of permanent teeth. However, baby teeth have important functions, and proper care can set the stage for excellent oral and overall health. The appearance of your baby’s primary teeth around six to 12 months of age coincides with changes in your infant’s nutritional needs. Beginning at six months, exclusive breastfeeding is no longer nutritionally sufficient; this is the age at which you should introduce solid foods. At six to eight months, when your baby can start to chew, strained or pureed fruits and vegetables are appropriate. As your little one’s teeth grow in and chewing abilities progress through 12 months of age, you can gradually add cereal, bread, cooked meats, and other adult foods to his or her nutritious diet. Although baby teeth are inevitably going to fall out and be replaced by permanent ones, making baby teeth last serves an important role that can have benefits into the future. Baby teeth serve as placeholders for permanent teeth. If they decay and fall out too soon, permanent teeth are more likely to grow in crooked. Your baby’s primary teeth are already in his or her mouth at birth; they are just invisible because they have not broken through the gums. Since they are already present, your baby can get cavities if you do not practice proper oral hygiene from the beginning. Do not let your baby fall asleep with a bottle in his or her mouth. Brush your child’s baby teeth twice a day as soon as they come in. Floss your child’s teeth as soon as he or she has two teeth that touch. Visit Dental Comfort Center for your baby’s first checkup when the first tooth arrives. We all remember hearing this: “Finish your milk, it’s good for your bones!” If you have kids of your own now, you may catch yourself repeating many of the things you were told growing up. Though parents occasionally exaggerate to get their kids to do certain things (such as eat veggies or behave), they’re spot-on about milk. Consuming enough dairy every day is crucial for growing children, because this can set them up to have strong and healthy teeth for the rest of their lives. To understand the effects of dairy on your child’s teeth, take a look at tooth structure. Think of it in terms of layers: the innermost layer is the living tissue, the second layer is dentine (a calcified tissue), and the final one is the enamel, aka the white part of the tooth. Keep in mind that 96 percent of your enamel is made up of minerals like calcium. 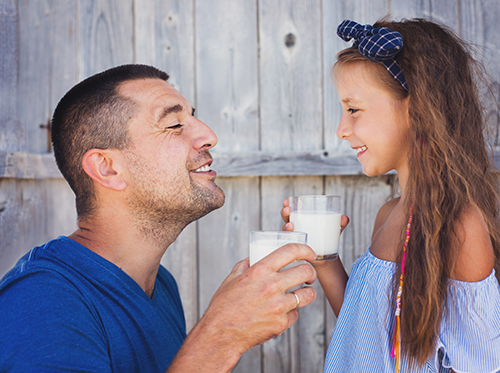 Now, milk and other dairy products are excellent sources of calcium, so when you consider the need to build strong enamel for the first line of defense, it’s easy to see the connection between dairy and good dental health. When your son or daughter consumes dairy products, the body sends the incoming calcium to growing bones, which includes teeth. This makes children’s teeth and bones stronger all around. Growing youngsters who do not get enough dairy in their diet are at risk for improper tooth development, as well as other dental problems. According to the U.S. Department of Agriculture, children under the age of eight should be receiving at least two and a half cups of dairy per day. Children older than eight require three full cups, which is the same amount recommended for male and female adults. If you’re looking for easy ways to incorporate dairy into your children’s diet, try snacks like cottage cheese, a milk-based smoothie, yogurt, cheese sticks, non-fat milk, and fruit parfaits, to name a few. Once you get a feel for what they like most, furnishing the ideal amount of dairy to their diet should be no problem! 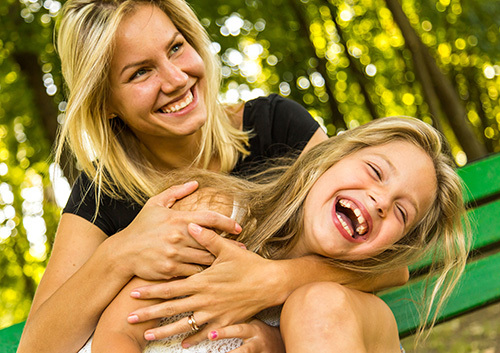 If you’re concerned about your child’s teeth or have questions about a healthy diet, don’t hesitate to contact our Sioux Falls, SD office and ask a member of our team.